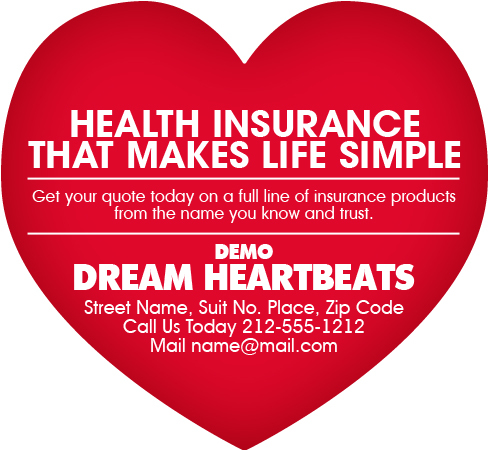 Have heart to say that you can serve your customers at any time they wish and that can be easily done through this customized 3.25 x 3 big heart shape health insurance magnet-20 MIL. This magnet offers you hearty space for imprinting your contact information, logo and other details. It stands perfect for mailing or even handing out during tradeshows or other business meetings. Bulk orders are appreciated and acknowledged with attractive discounts. Shipping, online design and artwork are offered for FREE. Request a quote to know discounts that you can grab on bulk ordering these custom 3.25 x 3 big heart shape health insurance magnet-20 MIL.